It is interesting to meet someone again after a long period of time, especially someone with whom you spent five days a week for about six years, but that is what school reunions are all about. People will have inevitably aged and may have gained bellies, more wrinkles, their hair greyer than before, or maybe have no hair at all, so there is often a little tension mixed with the expectation of meeting them again. But the end result is generally delight at reviving old friendships, at the renewed camaraderie, at all the nostalgia, the memories of sporting occasions, the sharing of photographs and, of course, the stories about particular teachers. Indeed, some who were slogged or mistreated by teachers may use the reunion as a kind of revenge. Inevitably, some stories will have taken on legs — “The older we got, the better we were”. The reunion is also an occasion to remember colleagues who have died in the interim. That is the kind of scenario that awaits these Jes boys who did their Leaving Cert 50 years ago as they return to the alma mater this weekend for a get together. They are, back row, left to right: Ollie Ó Dochartaigh, Mick Taylor, Len Kelly, Shane Bracken, Jim McSpadden, John O’Leary, Mick Kyne, Billy Lawless, Ian Quinn, Jim Wall, Alan Nevin, Paddy Creaven, Tom Stenson. Third row: Mick McCloskey, Kieran Duggan, Hugh O’Donnell, Ger Lynch, Dave Cunningham, Ger Ó Máille, Mick Carroll, Louis Burke, Joe O’Grady, Mick Horan, Kevin Murphy, Eamonn Lawless, Martin Quinn, Chris O’Dea. In the second row are: Brendan Carr, Gearóid ‘Chubby’ Moran, Bobby Coughlan, Mick Henderson, Tony Glynn, Ruairí Stafford, Mick Greally, Benny Murphy, Pat Flynn, Mattie Keane, Tommy Lally, Mick Forde, Diarmuid O’Driscoll. 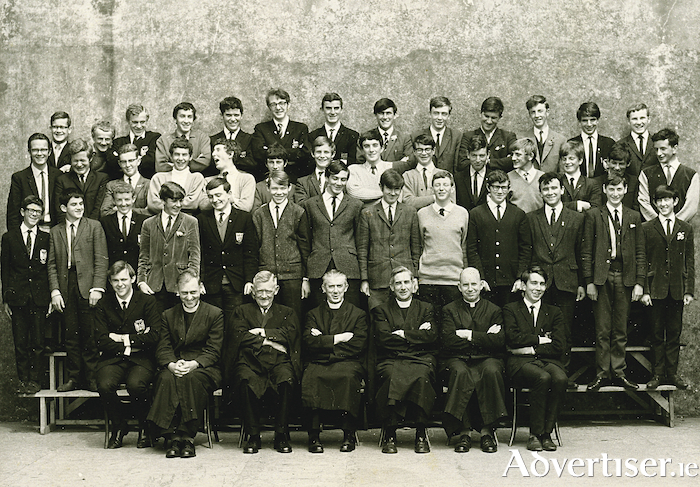 In front are Johnny McGinley, school captain, Fr Jim Christian SJ; Danny Griffin; Fr Gerry Perrott SJ, Fr Bob McGoran SJ, Fr Connla Delaney SJ, and Séamus Ó’Donoghue, school vice-captain.